Jacob our resident Nerf fanatic has been busy testing out the new Nerf Laser Ops guns for me this week. We received the Alphapoint set of two blasters to review from the lovely people at Habro. 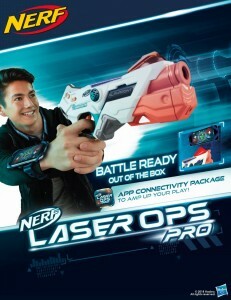 The new Laser Ops Pro range are our first Dart free guns from Nerf. I know Nerf have had a Laser Tag range before which you had to wear Vests, however the Laser Ops Pro guns are Battle Ready straight out of the box. We’re reviewing the Alphapoint Pack of 2 Blasters, which is brilliant as we have two boys so they can run around and laser blast each other. In the pack you get 2 Laser Ops Pro Alphapoint Blasters, and two rubber wrist straps which you place your phone in. After downloading the free App you can attach the phone to your wrist strap and start blasting. The App will keep score, let you upgrade your blaster, and let you know when you’ve been hit. One of the great benefits of being a laser gun is no darts flying around, plus unlimited ammo! Saying that I do wish there was a volume control as the laser sounds are really loud. Obviously outside its not as much of a problem, but inside with two blasting it gets very loud. I resorted to putting some tape over the speaker to dampen it down a bit which helped. Its a great idea that even though you have the two blaster set theres a game for when only one of you wants to play. The one drawback is that its really hard to hold your wrist up in front of the blaster to play the game, and I could only manage one wave of drones before my arm was killing me. The Alphapoint is also available as a single blaster which comes with a solo attachment for the end of the blaster, so you can easily attach your phone and play the game. I hope that the attachment is going to be available to buy separately as if you want to play the App game you really need one. Theres one more option available which is the Laser Ops Deltaburst. This is a single blaster, but comes with the solo attachment, wrist attachment, plus a very nice gadgety screen which displays how much ammo and health you have remaining. One last thing to mention is Batteries, Both guns take 4 batteries each. The good news is that they seem fine with rechargeable batteries. Which is great as not all toys like them, but these blasters have been working fine with them. Jacob really enjoyed the change from the usual Nerf action with the Laser Ops Pro. He’s always out the conservatory playing with his wide range of Nerf guns every night, however picking up all the darts from the floor is something he doesn’t enjoy as much. So these blasters were great for him. Another big plus for him was the fact that they have lots of cool lights with funky colours as you shoot. Great for dragging out playtime just that bit longer as he can still see what he’s shooting.